My Bloody Podcast #17 – ‘Return of the Living Dead Part II’! Here is the super spectacular 17th episode of the newest podcast under the MULTI-MEDIA MEN banner called ‘My Bloody Podcast‘, where the show is related to all things HORROR! Here on this new show, Preston Barta from Fresh Fiction and the Denton Record-Chronicle and I talk about everything we love about horror movies, tv shows, and horror themed music. In our 17th episode, our topics include discussions about the new robot-Chucky production, trailers for Santa Jaws and Climax, along with news on a new Friday the 13th documentary, and a great question that asked if “we were to be a zombie in a movie, what kind of zombie would we be and what special characteristics would we have?” and more. We also give you “Bloody Recommendations” of two horror films, being ‘Puppet Master: The Littlest Reich‘ and ‘Life After Beth‘. 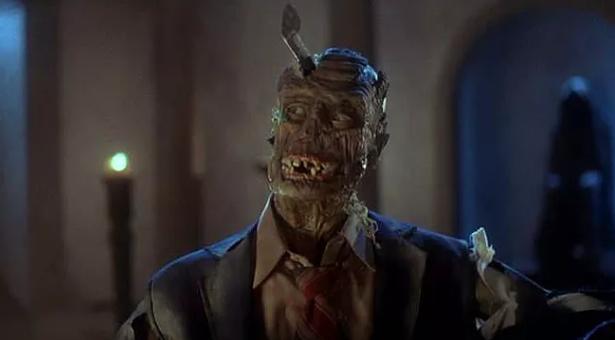 Our big topic is, of course, ‘Return of the Living Dead Part II‘, where we discuss the film, it’s production history, the actors, and more. It was so much fun. This episode is guaranteed to thrill you, chill you, and fulfill you. My Bloody Podcast #15 – ‘Dead Alive’! This entry was posted on Thursday, August 16th, 2018 at 1:31 pm	and is filed under News, Podcast. You can follow any responses to this entry through the RSS 2.0 feed. You can skip to the end and leave a response. Pinging is currently not allowed. « Theater Review: Dallas Summer Musicals presents ‘[School of Rock the Musical]’! !